The World’s Car of the Year winner, the Volvo XC60, was out celebrating with its stately sibling, the Volvo S90, in this year’s Crayfish Party. Every year, the Nordic Chamber of Commerce of the Philippines (NordCham) throws a shindig of epic proportions at the Sofitel Philippine Plaza Manila as a nod to tradition. What would crayfish and cars do with each other? Unbeknownst to many, that very odd combination of seafood and set of wheels set the stage for the creation of Volvo. It was August of 1924 when Volvo founders Gustaf Larson and Assar Gabrielsson had a chance meeting at Sturehof restaurant. Over crayfish, their conversation turned towards cars. “Couldn’t Sweden produce its own cars?” It was a question that led them to design the first Swedish car, the Volvo OV4. The rest, as they say, is history. Fast forward to today, the Volvos that were seen gracing the packed Harbor Tent of Sofitel still exuded that Scandinavian sophistication but definitely with a dash of daring. Sinuous curves, bold contours, and stylish lines were apparent in both new-generation Volvos. The Volvo S90 swathed in its luxurious splendor gazed at out the festivities with quiet elegance. The XC60, radiant with its global accolade as this year’s best car chosen by car experts and enthusiasts, had a more casual vibe. With its height and commanding presence, it stood proudly yet still blending beautifully with the spectacularly garbed crowd. 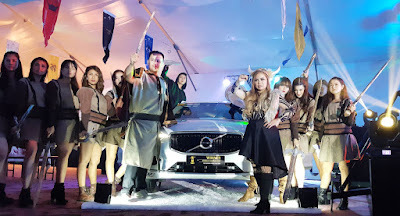 True to its theme “Vikings”, guests composed of foreign dignitaries, celebrities, multinationals residing and visiting in the Philippines, as well as the local community all put in the effort to come in costume. The event also showcased mouthwatering Nordic cuisine, a wide selection of Scandinavian dishes, and free flowing beverages. The annual charity event welcomed over a thousand guests all wanting to share their blessings to the mentally and physically challenged youth of the Chosen Children Village. Volvo Philippines continues to donate not only financially but also take time to spend time with the children at the home. As official partner for the past three years, Volvo cars has ferried NordCham officers and patrons to Cavite and be part in bringing joy to these children. Volvo’s genuine care stems from the promise of creating cars with people in mind. From the three-point safety belt that Volvo invented (and left patent-free so everyone can benefit from it) to the continued dedication to building cars that prevent accidents happening in the first place, it is a commitment that hold true until today. In the new XC60 – Euro NCAP’s best overall performer in 2017, for example, Volvo’s City Safety Autonomous Braking system has been enhanced with steering support. This is when automatic braking alone may not help avoid a potential collision. This and a host of intelligent safety systems work together with advanced technology and thoughtful design to come up with a car that makes life less complicated and more comfortable on the road.